Things are still moving along! Even though they're moving fast, I wish they could move faster! I am so anxious to move in and have more space. And be closer to things. This past week they finished the roof, started the plumbing, electric, and HVAC. They also added our garage door! And I must say, I'm impressed with the garage door. 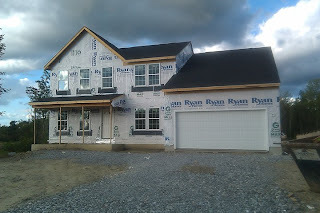 Ryan Homes contracts with Hamburg Overhead Door which is a very reputable company in the area. So, I am happy about that! I'm eager to talk to our project manager soon to find out when we might have our pre-drywall meeting! Its amazing how much bigger your house looks today compared to just a couple of weeks ago when just the framing was up. Looking good! This is just fabulous! You must be so excited! I get anxious to start this process at our place...but we're still a few years out. Oh, that's how I felt when the Miami roofing company arrived with the roofing supplies (Miami) when we were renovating our house! I was watching the process every single day until it was done. My wife and I were so anxious on moving in as soon as the last part of the house was complete. Congrats to your new house!